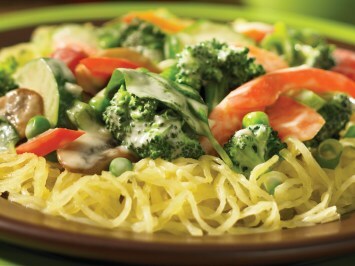 This yummy spaghetti squash recipe is a lower carb, higher nutrient version of pasta primavera. It substitutes spaghetti squash for the pasta. The combination of vegetables in this recipe make it a very nutritious meal, as well a being delicious. Melt butter in a large frying pan and sauté onions, mushrooms and garlic until soft. Add broccoli, peas, zucchini and carrots. Stir. Add the milk, chicken broth and basil. Boil briskly to reduce sauce a little, about 2 minutes. Add red pepper, green onions, cherry tomatoes and cheese. Heat thoroughly. Using a fork, scrape strands of squash into a large, heated, shallow casserole. Top immediately with hot vegetable mixture. The recipe comes from a wonderful cookbook called The Complete Best of Bridge Cookbooks Volume Two . If you know the Best of Bridge cookbooks you know you can count on their recipes to be fantastic every time. This recipe would make a lovely vegetarian dinner with just a salad and crusty rolls on the side. The sauce is so yummy it may also get non-vegetable eaters to eat their veggies. I have included this vegetarian recipe in our diabetic recipes because it is fairly low carb and full of healthy vegetables. As a diabetes diet recipe, I would add a protein like grilled chicken for a full well-rounded meal. If you like this spaghetti squash recipe, look here for more delectable vegetable recipes.